All Irish supporters will have one burning desire this evening - that something is gotten from the state of Denmark. This week, the Danes spent a week in the famous castle where Hamlet met the ghost of his murdered father; the Irish plotted away in Abbotstown where, to the best of my limited knowledge at least, there have been no violent deaths. The castle at Elsinore also contains a famous statue of Holger the Dane, a fearsome Viking warrior who sleeps in the cellar but will wake to save Denmark if and when the country is attacked. Given the prospect of a cautious approach from the visitors, he may have time for another 40 winks; Ireland won't be gung-ho - instead their aim will be to confront and contain and keep the tie alive so that they can hope to finish the job in Dublin. The play's the thing but in this case stopping the play is key for Ireland. Denmark are a team who deserve respect, but not fear and a player, Christian Eriksen, who should prompt caution but not necessarily over-anxiety. They are not an exceptional team although they have some good players and have benefited from a change in management and style. They lost twice in succession, in Poland and then at home to Montenegro, before finishing the group well, including a handsome 4-0 win at home to the dominant team in Group E, Poland. qualified Historically, they were never really known for their football in international or domestic terms until Allan Simonsen burst on to the scene in 1977. And then we had the Danish Dynamite of the Laudrups, Soren Lerby, Frank Arnesen and Morten Olsen, the cool head at the back. A small nation, like ourselves, they have qualified for a fair share of major tournaments since the 1980s but, unlike ourselves, actually won one in 1992 when they should have been on holiday. Given what we know and what we have seen, this challenge will be similar in some respects to the Bosnia play-off two years ago, with the hope of earning a favourable result in the away leg and trying to finish the job at home. Bosnia were also a seeded team, considered to be the favourites and they also housed a danger man, Edin Dzeko. In a match of poor enough quality conveniently hidden by heavy fog, the pattern was predictable with Bosnia dominating possession and territory before Ireland broke away for the crucial goal in the mist. It was the least-seen Irish international goal since we played Denmark, of all teams, back in 1968 at Dalymount; the match was abandoned early in the second half; we presumed it was 0-0 because we hadn't seen any goals but we were told it had been 1-1. Ireland would take that result tonight, whatever the weather. The basic fact is that the opposition have a player who is of a higher class than anything we have but that has often been the case in recent times; he is much more important to them than, say, Wes Hoolahan is to our team. Ireland have become familiar with such a scenario and this will present another different challenge. Eriksen doesn't always have as hugely a dominant impact on games as wisely suspected; he was fairly anonymous when Spurs lost to Manchester United, and during last season's Champions League campaign. With Spurs, he relies a lot on others around him being able to produce their best quality at the same time. In the Danish team, so much depends on him and he has been a key driving force for his country, particularly since the arrival last year of canny Norwegian Age Hareide, who has barely concealed the fact that he has been influenced by how his star man is deployed by Tottenham. Since scoring against Germany in last June's friendly, he has become a prolific goalscorer, notching nine in his last 11 all told, eight of them in the qualifiers. Given that he had only scored nine goals in his previous 60 internationals, his expanded influence and increasing importance to the team is clear for all to see. He normally prefers it if the opposition play an open style which will consequently give him the space and time he desires. Supplied These are, however, ingredients unlikely to be supplied so readily by the opposition he faces in the Parken Stadium this evening. Although potentially so influential, Eriksen doesn't seek to dominate a game in the manner that, say, Serbia's Nemanja Matic would have approached his meetings with Ireland, by picking the ball up from the back four and starting the play from there. Eriksen is a playmaker in the traditional style, playing across that line ahead of the midfield, although he has played in a midfield three for Spurs recently. Ireland are unlikely to deploy a specific man-marker as such. We will need to squeeze the space between our back four and the midfield in order to deny him the chance to drift into that dangerous territory where he loves to slip a pass or lash a shot in. Ireland are not unnerved by having to shackle a superior player; if anything, it focuses their minds albeit sometimes the natural impulse to disrupt has been to the detriment of their own attacking play. Just as was the case with Gareth Bale in Dublin, then Joe Allen in Cardiff, Eriksen will be expected to be the key to open our defence. Our aggressive way of playing the game won't be to his liking even though he has bulked up since his 2010 World Cup days. Allen was, by hook or by crook, forced from the fray in Cardiff and the Dragon fire was quenched by the removal of their spark. disclipined Tonight, vigilance and disciplined positioning by Glenn Whelan, if he plays, and Harry Arter will be paramount. It's not always Arter's strength; he tends to get sucked away from the area of most threat in his enthusiasm to track every single ball. This time, we need to be careful in terms of our tenacity because Denmark - and Eriksen in particular - are well-positioned to take advantage of any free-kick opportunities close to goal as his spectacular repertoire for club and country illustrates. Cautious aggression must be the watch words; Ireland have already lost David Meyler for this match, a player whose hustling and harrying abilities will be missed based on the evidence of recent performances. James McClean has become a talisman in this campaign but, of all the ten players on yellow cards, he would definitely not be a player the manager would want to be denied for Tuesday's return leg in Dublin. A tightrope must be walked. Ireland's job will be to prevent Eriksen's effectiveness over the two games and if they do, it would be fairly reasonable to presume that the task of progressing would have been made a lot smoother. Also, I'm not convinced enough by Eriksen's supporting cast although, even if the names may not be overly familiar to our parochial eyes, they are scattered around Europe, generally in the top leagues from La Liga to the Premiership, the Bundesliga to Serie A. The amalgamation of their education is not as limited as Ireland's and they can absorb different styles. You can be sure that the total emphasis would not be to knock it up to the big man Nicolai Jorgensen and Andreas Coenlius and take it from there. Hareide would have such a reputation from his Norway days; when my Irish team beat them 1-0, they had that "little and large" combination up front in John Carew and Steffen Iversen. But later I saw his Malmo side in the Champions League and they were technically proficient. They do retain an "English" appreciation of a main man up front and they are not an outfit who will be ruffled by the type of set-piece assaults Ireland will use; it is an old tactic but, as shown against Moldova, it can be effective. Some think it too crude but I think there is still a place for it. However, the Danes have a few big fellas in the team and even those that aren't won't be shy of dishing out a dunt or mind being on the receiving end of an elbow or three. They can mix it up, their passing and possession stats this campaign reflect a passing side but also one who can throw it long at times. With a player like Eriksen, you're not going to be launching the ball over his head all night. We've been able to blunt attacking weapons before and, given that they will feel the onus to attack at home, that may suit some of the things that have worked well for us in the group, for example McClean's pace on the break. This is where Martin could be tempted to deploy Callum O'Dowda's pace on the other wing but I wouldn't expect much substantial change from the methods and selection policy that brought us here. Hence, a formation that deploys a lone front-man and a five-man midfield, ahead of a settled back four, seems more likely than not with the only question marks surrounding Meyler's replacement and the forward option. Glenn Whelan has performed well for Aston Villa and got 13 minutes in Cardiff and he knows how to play the required position. I would prefer if he selected Hoolahan of course and when he played in Zenica against Bosnia, Ireland showed that they could do so without curtailing their ambition of stifling Dzeko and midfielder Miralem Pjanic on that occasion. 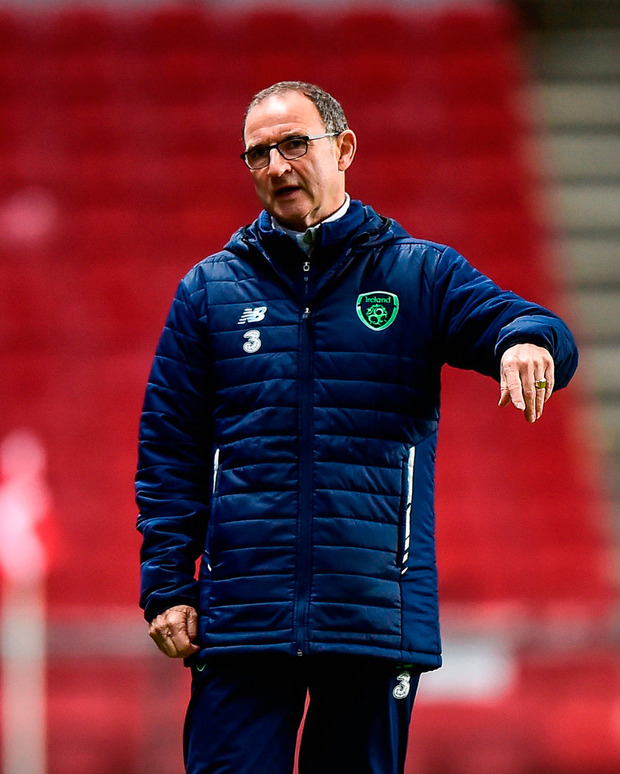 Hoolahan played both play-off legs against Bosnia but that was two years ago - but O'Neill (left) has made it clear that he doesn't trust him to play two huge games back-to-back. Daryl Murphy did ceaseless work in Cardiff with little support and service but he kept their centre-halves honest. Shane Long still does an effective job despite his goal famine. Martin is unlikely to select two up front, given his preference for five men in midfield and the absence of the trusted Jonathan Walters, normally such an excellent defensive cover on the right. 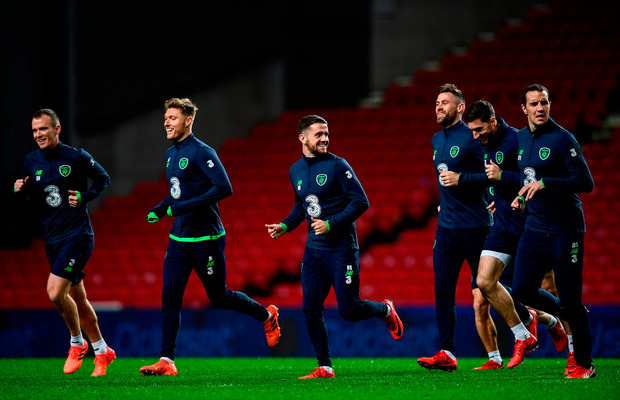 While Whelan is the more likely choice join Hendrick and Arter in midfield, the option is available to bring Robbie Brady back inside with O'Dowda getting a starting place but I think experience will win the day. But it seems now as if this team have found a way of playing that they are confident in and which has allowed them to eke out results to get into this play-off position. It's almost as if they don't need to be told the basics of organisation you'd expect from most international teams. There is finally consistency of selection, a settled back four - even without Seamus Coleman - and an acknowledgement that the players understand they won't have much possession even if we regularly get managerial communiqués advising the public that the team will have a go. It rarely happens, though; normally it is a case of holding out until the big moments arrive. As in Cardiff. Critical I had been critical of Jeff Hendrick and his contribution in this campaign but the Dubliner produced a big moment in Cardiff when luring Wayne Hennessy and Ashley Williams into a critical mistake. He tackled and tussled with Ben Davies, kept the ball in play on the end-line and then whipped in a magnificent cross which, if he did see McClean, was a marvellous spot as there were four Welsh players between him and his target. It was his biggest contribution since his goal in Belgrade that began the qualification. So we know how we will play even though it is not how many would like to see us play, being pinned back and ceding possession. If the result is achieved, and Ireland seize on those big moments, then that is all matters to most people. Finishing the campaign unbeaten away was a serious achievement, with three wins and two draws, and infers that the methodology, spirit and tactical substitutions have been effective. If they curb Eriksen's influence, this could be Hamlet without the Prince. The perfect script as we await the Second Act.